Shipyard Brewery | What's Cooking at the Genua's? 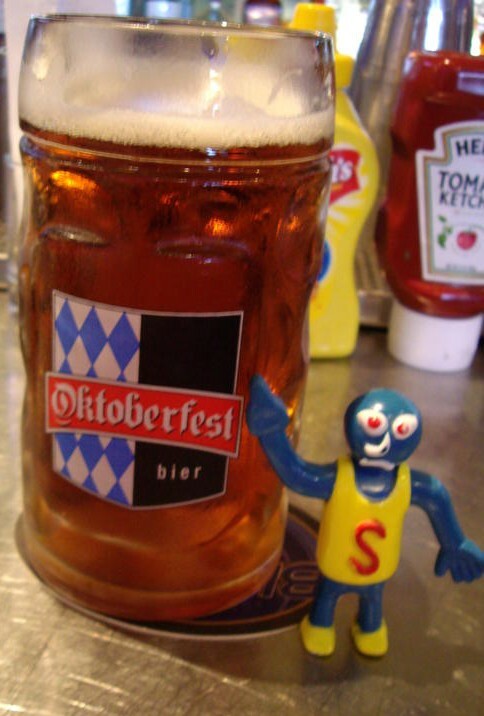 Sluggo Celebrates Octoberfest and Halloween! Who is Sluggo? Well, most of my friends and family know all about Sluggo. He’s a legend. Most people love him but there is a few who would rather he wasn’t around. Ok, it’s just one person that I know of who rolls her eyes when Sluggo is around. No names will be mentioned. She knows who she is! But I think we’re wearing her down! Secretly she loves Sluggo too! Sluggo goes everywhere with us. He goes skiing, he’s been on many cruises, he’s been all over the country with us and even went on a couple of trips with friends! He even got to go to Hawaii! My nieces and nephews love him too! They used to always ask if I brought “the little blue man” when I visited them. Like I said, he gets around. For those of you who are saying, Sluggo? Sounds familiar. If you are a fan of the older episodes of Saturday Night Live you will know him. He is Mr. Bill’s nemesis. Oh no!!!!! Sometimes I do forget to bring him places. I know, it happens. I am going to try and remember to bring him this weekend to a pig roast we are going to. 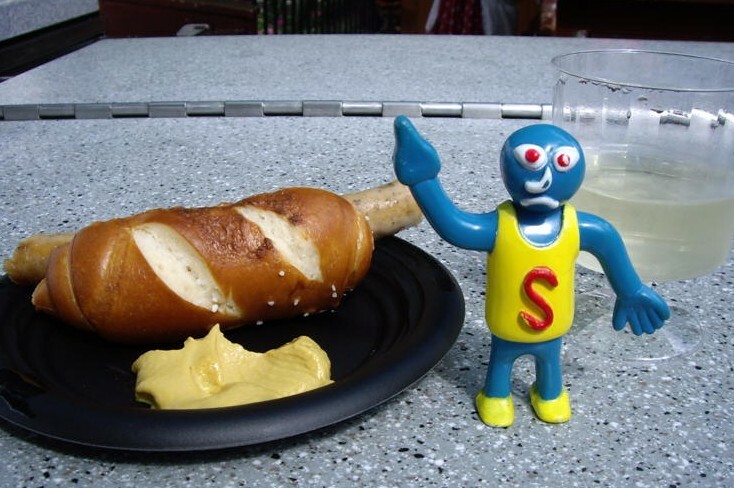 One of his favorite places to go to is EPCOT for the wine and food festival. We are going next weekend so I’ll have more pics. He really likes beer too! 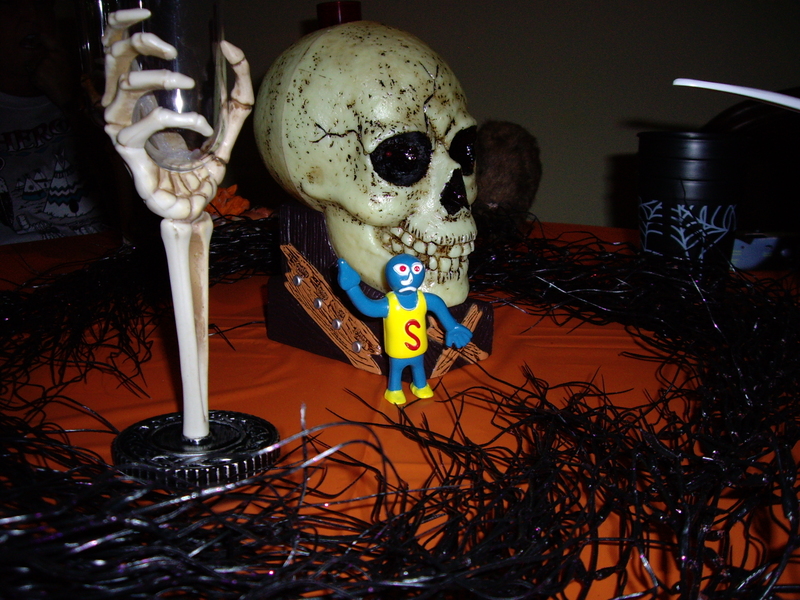 We even took him to a Halloween party a few years ago. John and Sluggo with the Hooters girls! Like I said, he’s been all over! Next up for him is cooking! He has the drinking part down pretty good so now maybe I can teach him to cook. So now you have all met Sluggo. Yes we are little nuts in this house. But it’s fun! 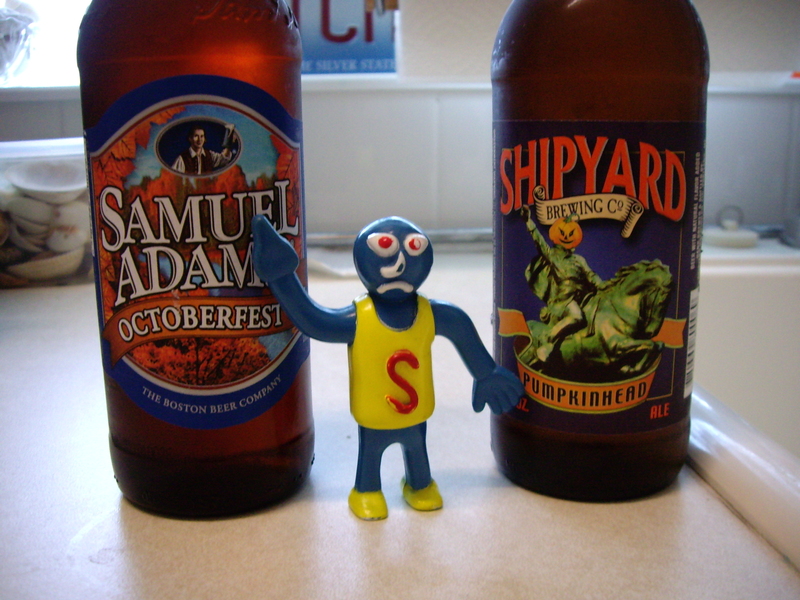 Today’s post is usually a cocktail recipe but for today we are just going to go with one of Sluggo’s favorite seasonal beers. Or should I say two? He can’t decide today. 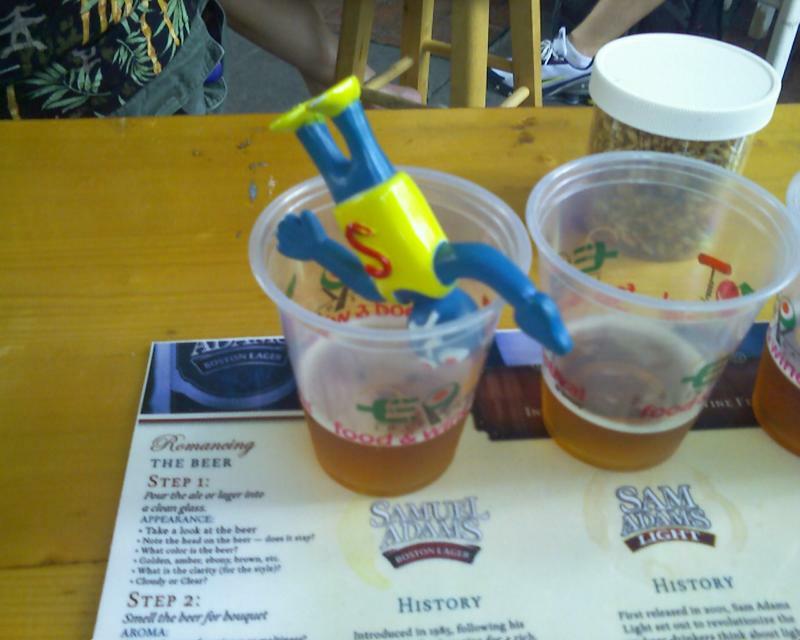 Should he have the Sam Adams Octoberfest? Or my favorite, Shipyard Brewery’s Pumpkinhead Ale? I say the Pumpkinhead! Tastes just like a piece of pumpkin pie! So yummy!! I wish all my decisions were this tough! So enjoy your weekend everyone and I hope you all enjoyed meeting Sluggo! He will be back!